There’s what we know, and what we used to know — and sometimes the latter might be more valuable than the former. What does this have to do with the new novel, Linesman? S.K. Dunstall, the author(s), is ready to explain. Two images—neither of which made it into Linesman —were precursors to this book. In the first, we read about an early Comdex or Macworld exhibition where the first Apple Mac was on show. An old man stopped to look at the Mac. He picked up the mouse and moved it in front of the screen to see what would happen. Not surprisingly, nothing did, for this was an early generation trackball mouse that you had to roll along the desk. The two young guys manning the booth laughed and laughed. For they ‘knew’ the complex, intricate, not-really-natural ways you had to move the mouse around on the desk to make something happen on the screen. You know what? That old man had the last laugh, for nowadays we use touch screens, which is a lot closer to what he was trying than it is to moving a piece of plastic around perpendicular to the surface. The second thing that inspired us was an article about old ways of healing which had fallen into disfavour but were coming back, because there was a scientific basis in their use and they worked. Maggot therapy, where a diabetic woman’s heel became infected and she was close to having her foot amputated. The doctor went along with her request to use live maggots onto the infected skin to eat the necrotic flesh. It saved her foot. Leeches, used as far back as Ancient Egypt, which are nowadays sometimes used to drain blood from limbs after reconstructive surgery, particularly in places were blood clots form easily. It was the article on maggots that got us talking one night after dinner (we’d finished eating by then). The old techniques—like the maggots and leeches—are still dismissed by most medical practitioners. Humans don’t look back much. We like to look forward. Unfortunately, it means we lose a lot of knowledge that we once had. Out of that dinner came one idea that stuck. How little we know and how much we have lost. More, what if we didn’t know it to start with? For example, we have no idea what the statues on Easter Island were built for. We can make educated guesses, but we’ll never know for certain. The only people who do know are the people who built them. History is littered with artefacts we can only guess about. Take it even further. What if the artefact wasn’t of human origin? What if the first humans in space found an alien spaceship? A sentient alien spaceship? Would they recognise it for what it was? Probably not. Especially not if humans had been slowly expanding outwards on old generation ships that they had cannibalised over the years so they were nothing like the original ships. They had lost contact with Earth a long time ago. If the ship was abandoned, how were they to know it was alien? And how could the ship communicate with them, for it wasn’t built to interact with humans? Going back to our Apple exhibition. Who is more likely to finally communicate with the ship? The two young guys who ‘knew’ that you had to roll the mouse along the table? Or the old man who waved the mouse in front of the screen? Better yet, a child, still young enough not to question an alien ship talking to her, still young enough to listen when the ‘lines’ on the ship spoke to her. That young girl was Gila Havortian, and she opened the way to the stars. Instead of travelling at sub-light speed, taking years to get to other worlds, humans learned to clone the lines of the alien ship and jump through the void to get from one place to another instantaneously. They gained instant communication within sectors of space. Humanity expanded, and was still expanding five hundred years later. In five hundred years the initial knowledge of what the ship could do—small as it was—would be lost as people discover new ways to use the technology. Like maggots as medicine, we find better ways to do things. At the start of Linesman, line ships underpin the galactic economy. The small number of humans who can ‘feel’ the lines and mend them are in high demand. Especially the tens, who can fix the full set of ten lines. Higher level linesmen are contracted to cartel houses and work from there. Then humans find another alien ship. Enter Ean, who came into the cartels late and is mostly self-taught. Even though he’s a certified ten, he is more akin to the old man holding the mouse up to the screen than he is to the young kids who ‘know’ what to do because they’ve been shown. Read an excerpt. Visit the authors’ site. Read their blog. Follow them on Twitter. As a lineman who is a fan of the Lensman books, the author had me at the title. The description merely confirmed things. Excellent imagery, especially for something so intangible. Touchscreens existed in 1984, too; HP had already marketed a personal computer with one. But what the old man was likely thinking of was the light pen, which was an even older technology that worked exactly like what he was trying to do with the mouse. 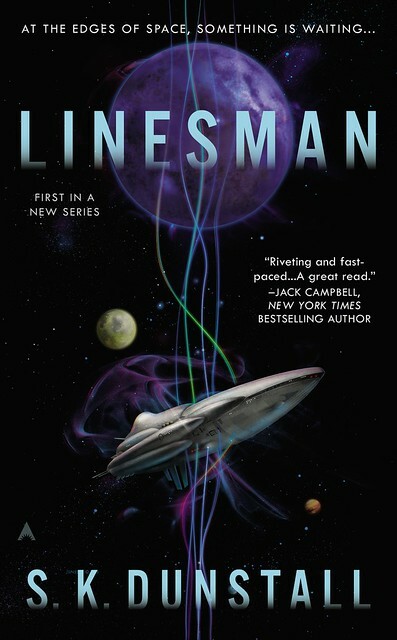 I was lucky enough to win an ARC of Linesman and absolutely devoured it. Amazing book, highly recommend it. I’m already looking forward to the next in the series, although the first book tells a complete story on its own. I don’t know why I bother with a book budget – July 2 and this years budget is already blown. Argh. Nonetheless – I am looking forward to this! I meant July 3rd of course. Sir, we are the human for the world word to keep join for the new ideas so we are best for the remember history and our wordpress.com whatever. Thank you for the great recommendation. After finishing part 4 of The end of all things, I was craving another good read.